Call him what you will, this is what we call him. He's always saving the day. Aside from Lemieux, the kid has saved Pittsburgh. You find a better name for him that describes his on and off ice ability, we're listening. PensU writer Will Eller was at the game. He'll have a post and some more pics up later today. 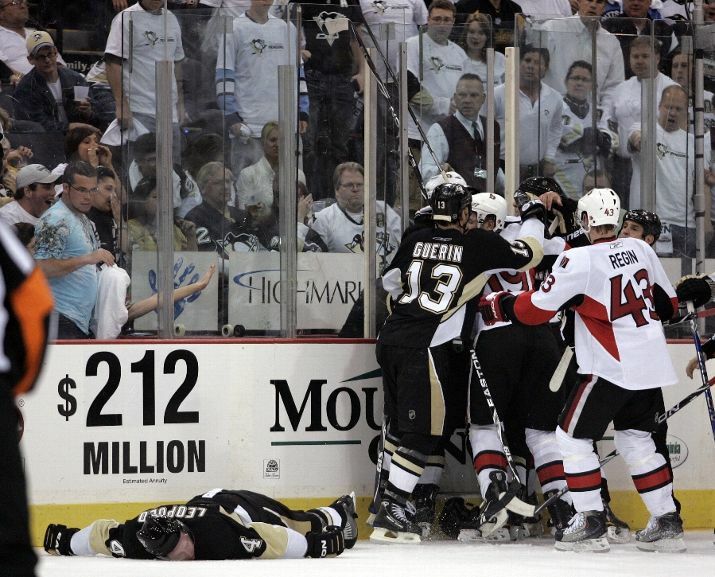 Not sure I saw a more physical game from the Pens all year. Laying 56 total hits on the Senators the Pens were able to come away with the key win and tie the series. Behind the absolutely stellar play from Crosby and a goal from Letang, our boys head to Ottawa tomorrow looking to take the lead in the series. Bridge-jumping bandwagon fans are stepping away ledges everywhere. Today is a good day. Right off the bat we all threw our hats in disgust. Just 18 seconds in the game Peter Regin tosses a wrister from the blue line to beat Fleury. Versus reported MAF was a half hour late to game, apparently that also meant on the ice as well. You wonder what Theissen thought to himself after that. Though after the kids were done googling how to tie a neuse, we all felt good about the play from the Pens thereafter, including Fleury. Holding Ottawa from a powerplay opportunity and to only 6 shots, all the while laying 23 hits behind a Sid's rebound goal to tie the game, confidence was restored. Though we all were a little shaky after Andy Sutton buldozed Jordan Leopold with, in my opinion, appeard to be an elbow. But it was close, I'm not going to say it was completely intentional. I mean, Sutton is huge and has been known for destroying people. But the way Leopold went down, you immediately got angry and wanted justice. Let's not forget what Rupp and Talbot did to end the period. It was time to send a message. No scoring, but the period was not without chances. 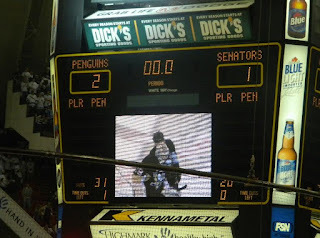 The Pens outshot the Sens for the second period in a row. Talbot and Cooke began pestering everyone, mainly Ruutu. That's their jobs, they'll score when called upon. The game remained tied after 2. 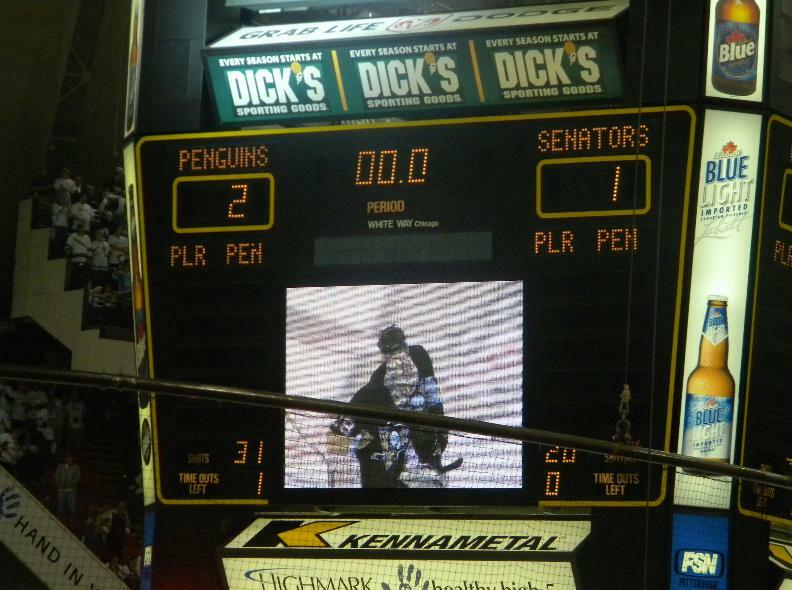 If this goal happens, Pens lose, plain and simple. Nearing the end of the period we saw Sid dribble past Spezza something like Derek Rose might do on me. Circling the back of the net and dancing to the oldies, Sid dishes the puck to Letang. In that split second when you saw number 58 with the puck you immediately thought, "no way is this hitting the net." But after you saw the netting shutter in resistance, all that went away. 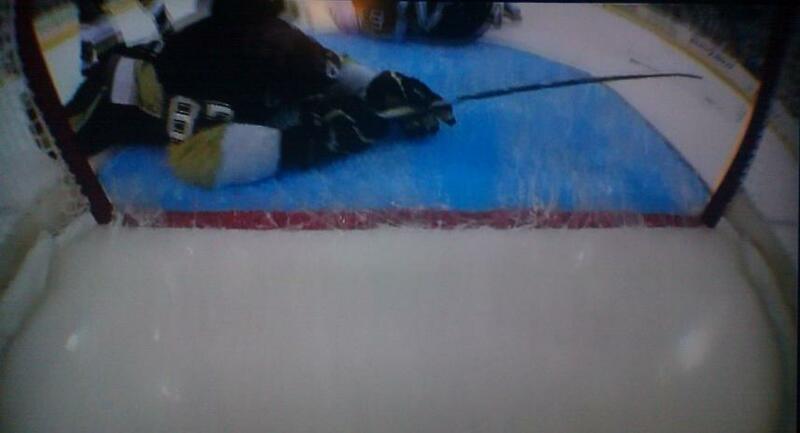 "If I would have missed the net [after what Crosby did], I would feel really bad," Letang said. "He [Crosby] is a special player, he's probably the best in the world." Holding off the 6 man attack from the Sens in the last minute in a half, that was it. 2-1. Every player on the Pens had a hit, Orpik had 9. 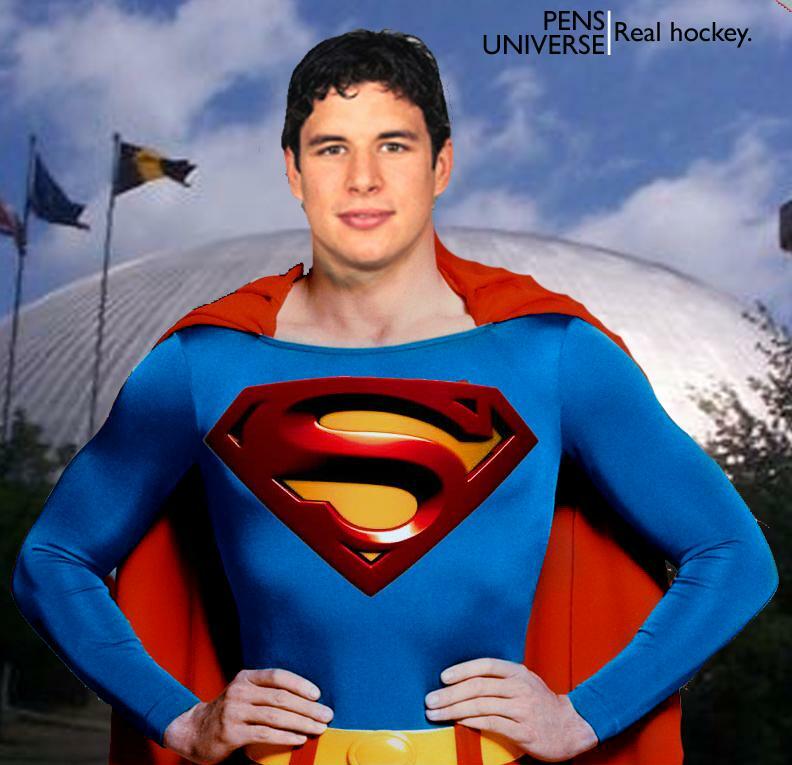 Crosby went 13-19 on the draw, much improved. Third Line did their thing. Aside from Sid, corporately they are my top star. Mike Rupp, 6:46 of ice time, HUGE impact. Oprik and Letang, 28 shifts a piece. damn.